a pair of strings (a pair of chromosomes) in diploid GA. The fitness function is the essential measure of chromosome strength to occur in the next generation. The higher fitness of chromosome the greater chance to reproduce. Reproduction in population is thought as a randomized process based on the fitness function. Only these chromosomes that are selected can take part in producing the next generation. In haploid models, a pair of chromosomes is a pair of parents that exchange their genetic information through the crossover process whereas, in diploid models, the process of gametogenesis uses the crossover mechanism to exchange genetic information between gametes. In spite of that small difference between haploid and diploid models in both cases it is demanded to find the crossover point or points (in models with multiply crossovers) on two parent chromosomes with assumed crossover probability. Apart from that random process genetic information can be modified through mutations. They also are random and occur with prescribed mutation probability. To enhance genetic variability of newly created population also genetic reconfigurations can be applied to chromosomes. Haploid genotypes (HG) are built from single chromosomes whereas diploid ones (DG) from pairs of chromosomes. Making genetic material double results in enriching genetic expression process of dominance while a single chromosome is directly decoded to the phenotype. where fmax constant ensures non-negative value of the F(x) function. where Cmin constant ensures non-negative value of F(x) function e.g. Cmin = |fmin|. where r is penalty coefficient and H function can be set as e. g. hi2(x). where r is a penalty coefficient and H function can be set as e. g. hi2(x). where σ is the standard deviation of F and C constant is from the range [1, 3]. where the value of C power depends on the problem. 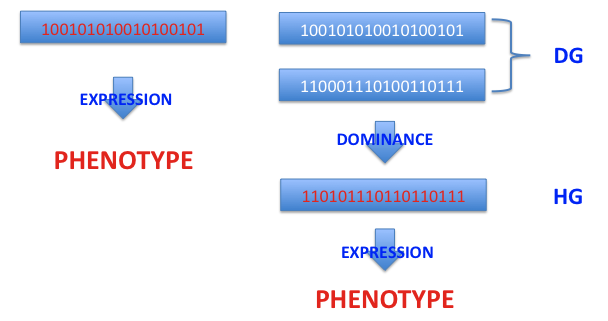 where xi and xj are phenotypes of i-th and j-th chromosome, respectively. Otherwise, when the computed distance reflects similarity between two genotypes the Hamming measure is used. It is defined as the number of different bits on corresponding sites on both chromosomes of equal length divided by the length of the first or the second genotype. The sharing function S(d) can be set as a linear or a power function of a distance dij between chromosomes i. e.
where the sum is over j. Applying a sharing function to the genetic algorithm leads to splitting a population into a set of sub-populations. Thus the sharing function approach can be done to simulate species creation in genetic populations. For that reason, in mathematical optimization problems, it is used in searching for optimum of multi-modal functions. The whole roulette is divided into sectors of areas proportional to fitness factors. Computer simulation allows to choose one genotype each roulette turn. The roulette is turned up to complete a new population. modified roulette: The main part of algorithm is the same as in the roulette method. The difference occurs when a chromosome is selected to replication. Then its fitness factor is diminished by an assumed value (e.g. 0.5). where Fi is a fitness of i-th genotype and n denotes the population size. The rest of free places in a new population is given to those genotypes which have greater floating parts of ni. random based on rests - type I: first step is the same as for deterministic selection. The rest of free places in a new population is taken from the roulette method. The roulette is built from the floating parts of fitness factors. random based on rests - type II: first step is the same as above. This time floating parts are treated as success probabilities in the Bernoullie's method. Wetzel's method: at the beginning pairs of genotypes are chosen by the roulette method. From each pair that genotype which have greater fitness factor is chosen to a new population. In each case, the selection is done up to complete a new population. Crossover is a process applied to a pair of chromosomes. As the first step the crossover point is randomly chosen with assumed probability. That point defines a position of dividing bit on both chromosomes. Bits taken before the crossover point from the first chromosome are merged with bits from the second one lying on and after that point. In that way a new genotype is created. The second genotype from the new pair is formed equivalently. In the example shown below cross point is 5. Mutations are applied to each new chromosome with prescribed probability. If mutation occurs a bit value is changed to its opposite charge i. e. 1 → 0 and 0 → 1 in diallelic models whereas in triallelic ones this change is like this one: 1R → 1D or 1R → 0.
inversion: during inversion chromosome is cut in two randomly chosen points. The part between points is reversed and merged with both ending parts. A little modification to this type of reconfiguration can be applied. The inversion (linear) is done with probability 0.75 otherwise with probability 0.125 right-end-inversion or left-end-inversion is done. partially matched crossover: two chromosomes exchange genetic information. The matching section is indicated by two points randomly found. Then alleles from both chromosomes from matching section create a map that is used to construct new chromosomes through transpositions. The numbers below present alleles located in ordered way on a chromosome. So far alleles were set on a chromosome from the first to the last e. g. 1 to 9. Now alleles can have permuted ordering. order crossover: the matching section is indicated by two points randomly found as previously. Then alleles from matching section create a transposition map. The alleles from the section are substituted by holes (H). Then the part before matching section is added to the part after it and holes are shifted to the matching section and replaced by alleles from the matching section of the complementary chromosome. cycle crossover: at the beginning the first alleles from both chromosomes are set as starting values, in turn, the corresponding allele from the complementary chromosome is set on the current chromosome. It lasts as long as the starting allele is reached. The free sites are taken from the complementary chromosome. where xi and yi are i-th components of vectors x and y, respectively. These vectors may represent fitness vectors F belonging to different chromosomes in a population. Then problem of finding better solutions on the basis of higher value of scalar fitness function is replaced by searching for a group of chromosomes fulfilling the above-written condition. The Pareto condition, due to the way it is formulated, can be naturally applied to find a function minimum. When opposite problem is put forward a fitness vector should be multiplied by -1. Then above-written condition can be used straightforward. That part of chromosomes that satisfies the Pareto condition has the same power to reproduce which results in the same rang value in selection routine. Having selected the first group of Pareto-positive chromosomes the next one can be chosen in the same manner within a sub-population of Pareto-rejected chromosomes. The group of genotypes has assigned successive rang value, obviously. The lower rang the greater number of children associated with. That procedure continues up to finding rang values for all chromosomes in population. To obtain better results one can associate the multi-parameter Pareto-based problems with a technique of species forming (e.g. using the sharing function approach). Package for genetic search - OptFinder. To test this software partially, go to Online Optfinder Page. Genetic algorithms (GA) play also an important role in learning systems called the Genetic Based Machine Learning Systems. One type of these systems is called the Classifier System. To learn more go to machine learning page.